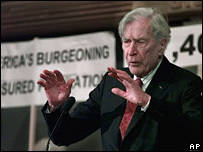 Renowned economist and liberal thinker John Kenneth Galbraith has died in the US at the age of 97. He died on Saturday of natural causes in hospital in Cambridge, Massachusetts, his son Alan said. The Canadian-born Harvard professor wrote over 30 books on socio-economic issues, the most famous of which was The Affluent Society in 1958. He moved in political circles, advising Democratic presidents and serving as John F Kennedy's envoy to India. UK Chancellor Gordon Brown paid tribute to him as a "brilliant economist and writer and a great friend of the United Kingdom". "Even in recent years in his 90s he was never slow to give me and others advice," he said, "and he will be remembered for his erudition, his wit and eloquence, and particularly for his economic insights into our age". JK Galbraith taught at Harvard University from 1948 until his retirement in 1975, but continued to publish books on socio-economic issues. An advocate of government action to solve social problems, he focused on issues such as the distribution of wealth in society. He was awarded the Medal of Freedom twice, by President Truman in 1946 and President Clinton in 2000. Alan Galbraith said his father, who was admitted to hospital two weeks ago, "had a wonderful and full life".